Katie and I had just returned from the mall. She brought her packages to her room and I headed into the den, where I knew I’d find Brooke. There she was, in her PJs, watching Dora while rolling back and forth across the floor on her scooter, as you do. Luau was hovering over my shoulder. I didn’t know what was wrong, but I knew something wasn’t right. The air was just .. off. “I need to tell you something, Hon,” Luau began. I turned to look at him, then looked back at Brooke. Everything looked like our version of normal. Why didn’t it feel that way? Stories in which everything is okay don’t begin with a reassurance that everything is okay. What the hell was going on? He saw the panic on my face. I saw the reticence to tell me whatever he had to tell me on his. The next twenty seconds took three minutes to pass. “We went out for a bike ride,” he said. I knew what that meant. Brooke rode her bike on the sidewalk, the only place she will ride it, and he walked alongside her. It’s what we do. I studied my girl. She looked all right. But, something. What? He explained that Brooke had gotten just a little bit ahead of him on her bike (as she always does). She was about to cross over a driveway when he spotted a woman in a car, backing out. Panicked, he shouted to Brooke to stop. 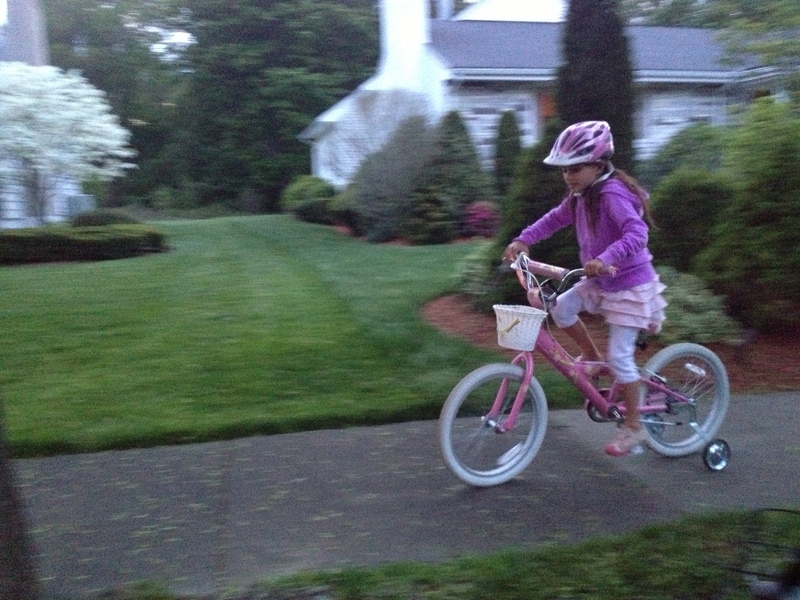 She did, with her front wheel about a foot into the driveway. The woman in the car didn’t stop. She backed out, tapping Brooke’s bike with her bumper. The impact was not enough to hurt her, thank God, but it was enough to knock the bike to the ground. The woman jammed on her brakes, then put the car in gear, driving back into the driveway. She then looked back at Brooke, then at Luau, reversed again, PULLED OUT OF THE DRIVEWAY AND DROVE AWAY. Brooke was fine, he said again. She was frightened, mostly by him yelling, but she was fine. We both know that fine right after trauma doesn’t mean fine. It takes time for our girl to process big events, big feelings. She stepped off the scooter and curled into my lap for a squeeze. “Yeah, there might be a delay,” I said. I held her with everything I had. I am nauseous writing this. She could not possibly have known if my little girl was okay. I don’t know what to say. I don’t know how to end this post. I just know that something is really, really wrong. This turns my stomach in knots. My kids like to run as we walk and they know they are supposed to stop at each driveway until I give the all clear. But sometimes they don’t. Many times, actually. And reading this…I can see this happening all too easily. But to not stop? To hit a child’s bike and NOT STOP? That’s a million types of wrong. “Who does that?” I really, really think you should ask her – Luau will know, which house she lives in, and I really think you should ask her – not to swing a bat at her, but to ask her and hopefully teach her, how to behave a next time – if any should occur. Shudders…. I think you should file a police report–it was a hit and run. Big hugs to all of you. I agree!! There was no excuse for that. No reason for being late somewhere could ever excuse that! What the eff?! This makes me mad on SO many levels. For any kid! As far as I’m concerned, that’s a hit and run. When you hit someone, YOU’RE SUPPOSED TO STOP. She didn’t get hurt, but she knocked her over. On a bike! The police would totally charge her. What an a-hole! Awful!!! Horrendous!!! I hope you are all ok today. I think if that were me, I’d have to bring my husband and pay a little visit to enlighten the driver that the world doesn’t revolve around her. I’m hoping this driver is a late teen or twenty something who lives with parents. Maybe they could help shed some light here. It’s all a learning evperience. This driver has a lesson to learn. If that doesn’t work, simply make a copy of todays blog post and put it in their mail box. She drove away? What a kind soul……she shattered the vision of safe for you and your family. I’m also fairly sure that’s a reportable offense. I am praying Brooke was far enough away from your house that this horrible incident isn’t compounded by any possibility that this woman might know who Brooke is. I’ve seen people overlook some pretty atrocious stuff that has happened to my kiddos, assuming something (aka everything) is somehow their fault. I hope that she is *just* a random reprehensible, self-absorbed, inconsiderate a-hole. The only thing I can think of is that maybe she didn’t realize she’d made contact? And just pulled back into the driveway because she heard the yelling, and then thought Brooke had simply fallen off the bike and Luau was right there to help her? That’s the only place my brain can go. The other choice is too… I can’t even. That is horrible. Just horrible. I hope that lady is wracked with guilt. I hope your daughter processes it ok.
“Who does that?!? !” This is all I can think of to say. I mean, seriously…she didn’t even stop or call out her window to ask if Brooke was OK?! Very wrong. And very scary. I’m physically ill at this. I agree with Kim. File a police report for hit and run. The fact that Brooke wasn’t physically hurt is immaterial. No words for this. What the hell is indeed wrong with some people? So sorry Brooke and Luau had to go through that. So glad she’s okay! Seriously! We live in a kid-filled neighborhood, and, even with me backing up like I’m on an army surveillance mission, I’ve had a couple of close calls. One dark night, we had our service dog in the back of the van, and she unusually began alert barking. The family walking had seen me, but I had not seen them. I couldn’t apologize enough. Even our service dog is smarter than this bi….well, you see where I’m going with that. I cannot imagine actually making contact and driving away. I guess the only thing worse would be if she had gotten out to see if there was damage to her car. So glad Brooke is ok. Score 1 for the Angels. This one should be reported to the police. Not to stop and check or even ask if Brooke was hurt? or her bike? I’m so sorry to hear you all had to go through this, but very glad she is ok.
No need to file a report…just taking devil’s advocate…maybe she thought Brooke rode her bike into her car? Still, not to stop and get out to make sure everything was okay seems a bit short sighted. People walking along your sidewalk are people who live near you. Was she a young woman, maybe a teen? Perhaps she didn’t know what to do. If you feel the need to contact the people who live at that house, you should do so in a letter. People can be very angry when confronted at times. And remember sometimes even good people do stupid things. Not an excuse but sometimes I fine people jumping to hate someone who perhaps made a mistake and needs to make amends but anger/hate towards them just makes it harder for them to do the right thing. One thing is certain to me, that driver is definitely NOT OK! Hope Brooke isn’t traumatized, and for you and Luau, I’d suggest a big glass of wine, or something “stiffer” if you need it-but after filing the police report. I definitely think you should file a police report. That woman needs to be held accountable for the asinine thing she did. Glad Brooke seems to be holding herself together. I’m all for the police report. In Michigan, that is negligence and hit and run. with a witness (dad). regardless of injury. She would be required to stop until released by police. tapping her bike could have resulted in injury from the fall and or caused emotional stress that may require treatment. Sure you want to be the parent that says “no harm no foul” but I could only contemplate that for someone who stopped, rushed around and CHECKED ON MY CHILD PERSONALLY. otherwise I probably would have chased that chick down and kicked her. I would go back to the house and approach the people who live there. If they do not respond appropriately, THEN I would file a police report. I agree, she may have been shocked. She may have thought Brooke wrecked her bike if she didn’t hear or feel the bike hit her car. Still, I would have at least stopped to make sure the child was okay even if I thought she had just fallen over. I don’t think this is something that should be left as is. I am so sorry! I have no other words to express what I’m feeling. I love all of you so much! I’m glad she’s physically OK. Hope she continues to enjoy riding her bike, despite this incident. As for the woman, I would have the police pay her a visit. Even if they don’t file any charges, it will scare the crap out of her, which is the least she deserves. I hope Brooke is up and back on her bike, that the delayed reaction was mild. I love Glennon from Momastery.com who always sees things with a forgiving and non-judgemental way. Hard to do when your little girl could have been seriously hurt, and is still possibly recovering from the incident. But we don’t know what the woman “knew” had happened or why she did what she did. Whatever you do, do this with love and grace for yourself, for Brooke, and for the neighbor. People are jackasses. I know someone who was hit by a car, the person hit him on her way INTO her driveway, he was on the ground, she pulled into her driveway and went into the house as if nothing happened. The husband came home, my friend called to him and asked him to call 911. The cops came and the woman denied hitting him. There’s all sorts of crazy out there. I am glad she is OK and it’s a big deal that she stopped when Luau told her to. I would talk to the neighbor at the very least. Lots of hugs to you and your girl. Oh my God!! I would still be camping out in that woman’s driveway….waiting to hopefully only verbally berate her, if I could possibly do only that!! Thank God a million times that Brooke stopped at Luau’s plea! Don’t let your mind go anywhere else!! Just know she is fine!! Big hugs for you and your girl!! I agree! The police should be told! This is ridiculous! that’s TERRIBLE! If she could drive off after that, what else is she capable of doing? Age doesn’t matter, nerves don’t matter, the reaction the driver had was wrong. I wouldn’t just ‘let it go’. I couldn’t. I’m not saying wait and verbally (or physically) attack the lady, but she can’t just be let off the hook. What did you do, Jess? Truly this person should not be allowed to “get away” with just driving off. Maybe, just maybe, she doesn’t understand what she did was wrong. Please either have the police go and tell her or you and your husband neighborly pay a visit and educate her… Before something more tragic happens..
As it was a driveway I hope that means it was a house and that the woman resides there. I would pay her a visit. In fact when I was walking with my kiddo when she was only about 4 years old a woman had accidentaslly let her dogs out of the yard and they attacked my daughter. Or tried to. I stepped in front and yelled loud deep yells at the dogs intimidating them away from her. The woman came out and acted as if everything was just fine. I cleared up that misconception for her with a long and angry talking to…but that’s just me. What on earth is wrong with people?! I would go and speak with her at the least, file a police report possibly, as well. That would have to be considered as far as what impact it might have on Brooke. When my nephew was 8, he was riding his bike in the driveway and lost control of the bike. He went about 2 feet into the street, when a car, driving too fast, flew down the road and hit his bike. He too was fine. But the woman driving got out of her car and yelled at him, then my sister in law and I for not watching him and teaching him basic safety. The gall of that woman is very similar to the gall of this one. I can’t even conceive what kind of human would not get out of her car to make sure that Brooke was ok! Like, WOW. I’m glad she is ok, physically, but my stomach is already churning knots. How scary and how unbelievably rude of that woman to just drive off.